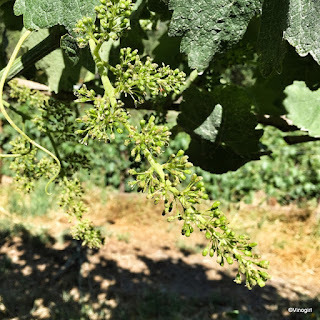 Yesterday, when I was working in the vineyard, stuffing shoots and suckering trunks, I noticed that bloom is rather advanced in the Cabernet Sauvignon vines. How did that happen? There didn't seem to be much going just this time last week. The weather was warm at the beginning of the week, but temps have cooled to the low 70s and it's been a bit windy. Whatever is going on the vines seem to like it. Carry on buddies! Still loving them thar hills. Last week, due to an event that was held at TWWIAGE, I was able to taste this incredible wine, the 2014 Smith-Madrone, Cabernet Sauvignon (Spring Mountain District AVA). The Wine Institute of California was holding its third international 'California Wines Summit' and I was lucky enough to be involved, albeit in a microscopic capacity. The Summit was a week of tastings and events meant to showcase California wines to key wine-media and trade folks participating from 10 different countries. (Yes, the United Kingdom was well represented.) There were a lot of great wines in attendance also. 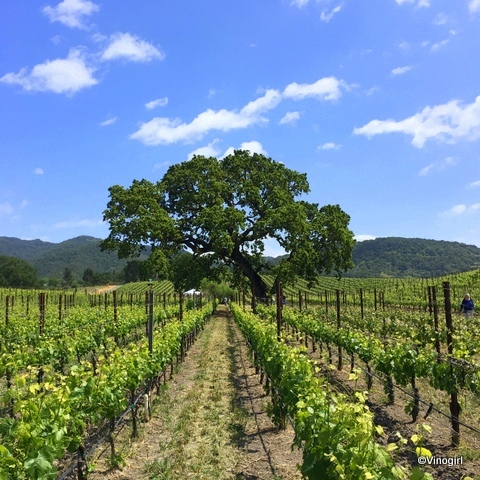 I don't think the 2014 Smith-Madrone has been released yet, perhaps I shouldn't even be blogging about it, but it was just so spectacular I can't not write about it. Whilst I personally think it's insane that some producers are releasing their 2014s already I just couldn't put my glass of this 2014 Cabernet Sauvignon down. And over the past 10 days I haven't stopped thinking about this wine. (I'd estimate that only half a dozen wines have had that effect on me in my entire life.) Abounding with black fruit and spices this wine is certainly, in my humble opinion, not ready for drinking yet. But, if my experience with a 1985 Smith-Madrone is anything to go by, I am predicting that this wine is going to be magnificent, oh, about 29 years from now. Can't wait. Bloom is bustin' out all over. Everything is blooming in Vinoland, except for the Cabernet Sauvignon. But that is not surprising, as the Cabernet Sauvignon is always the last variety to go through bud break and bloom. The wonderful weather we have been having in the Napa Valley of late is absolutely ideal for bloom. Vitis vinifera generally likes the temperature to be about 85°F during bloom and will quite happily bloom away in the heat - until temperatures reach above 95°F when, like me, the vines get a little toasty. Temperatures above 95°F can result in bloom, and fruit set, being adversely affected. The grapevines and I are so sensitive. ...Today would have been Joey Ramone's 66th birthday. 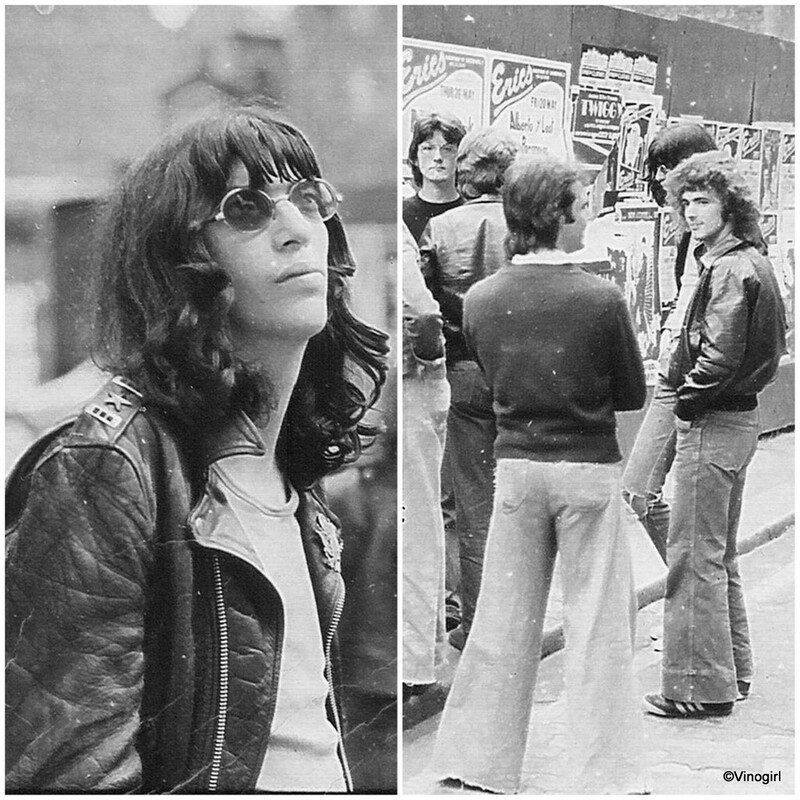 And also because it is 40 years to the day that Thud actually met The Ramones, in Liverpool, on May 19th 1977. 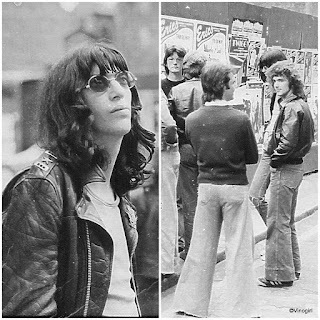 That particular day was Joey Ramone's 26th birthday. Thud still owns The Ramones t-shirt he bought that same day from Joey's brother, Mickey Leigh. It's not a secret that The Ramones are perhaps my favourite band ever, thanks to Thud, and it is no surprise to me that I enjoy their music now just as much as I did when I was a teenager. What has been a surprise to me is that, 40 years later, we now have a new generation of Ramones fans in the family. Thud's nine, almost ten, year old daughter possibly knows more about The Ramones than me and her dad combined. It's amazing to witness and it's a constant source of amusement to me. Thud can be seen in the photograph on the right, or at least his leather jacketed-back can be seen, talking to Joey. Great memories. Happy birthday Joey. And RIP. Photographs courtesy of Ian Dickson. I doff my calyptra to you, Pinot grigio. I noticed last week that the Pinot grigio vines were starting to bloom, just a little bit here and there. A week later, I am estimating that they are probably about 60% through bloom, (or anthesis). Just look at those calyptra coming off. There is a lot going on out in the vineyard right now; flowering, shoot stuffing, suckering, sulphuring, weeding, mowing, etc. Phew! The vines are busy, so am I, but I am not too busy to pause and acknowledge that the vines are doing most of the work. Go buddies! A tale of two bottles. I was just saying to someone recently that, of late, I rather enjoy it when I open a bottle of wine that I can't drink. That is, undrinkable for a variety of reasons; cork taint, over the hill, etc. And then it happened the very next night. The wine on the left, the Henry Earl Estates 2013 Merlot (Red Mountain AVA), was totally oxidised and, yes, undrinkable. Down the sink it went. I suspect that the wine was in this state when it was bottled, probably having been produced poorly. (The cork appeared sound, no leakage.) This bottle of Merlot was a gift, which probably contributed to my rapid rejection of this wine. The wine on the right was a quick replacement - simply, the next bottle at hand - as dinner was being served. The Goosecross 2014 Amerital (Napa Valley AVA) was tasty, quite moreish and not oxidised. And, being a blend of 57% Cabernet Sauvignon and 43% Sangiovese, it just so happened to be a much better pairing with my Bolognese. Life is too short to drink oxidised oenos! New Cabernet sauvignon leaves, old Cabernet sauvignon tendrils. Vinoland's grapevines are enjoying a fantastic start to the 2017 growing season. All four grape varieties are flourishing right now; lots of vigour in the vines, so lots of shoot stuffing for me to perform. The weather has been a bit up and down, mid 90°s last week, mid 60°s the past two days. I hope we are not going to have another cool growing season like that of 2011. Only time will tell. Afternoon in the Vineyards: 2017. This afternoon, Vinomaker and I ventured out of Vinoland, but we didn't go too far. Staying fairly close to our Coombsville home, we decided to attend Afternoon in the Vineyards the annual event hosted by the Napa Valley Vintners. And, for the first time, Vinodog 2 came along with us. The folks at Faust, our vineyard of choice, farm approximately 112 acres in Coombsville's gently, rolling hills. The vineyard is planted to five grape varieties; Cabernet Sauvignon, Merlot, Petit Verdot, Syrah and Sauvignon blanc. And all the vines, from what I could see, are head-trained and cane-pruned. The weather was a tad cool, the scenery was beautiful and V2 had a poo. Not much more to say really. Oh, except that I did taste a Faust 2012 Cabernet Sauvignon, but didn't think an awful lot of it; too plummy and one-dimensional, not a lot going on. Happy May Day! By which I mean a cheerful May Day to all, but only in the ancient-spring-festival-laudatory-way of celebrating the first day of May. I love a bit of paganism now and again. Yes, it is spring and, like me, Vinoland's grapevines are suitably enthused. I spent most of the past four days making sure that the new, rapidly elongating shoots are securely tucked up behind the trellis wires. I love viticulture. I love farming the grapevines in Vinoland, but, at this stage in my life, I wouldn't want to pursue viticulture as a full time job. Things, and people, change. TWWIAGE is in the process of hiring a viticulturist. The vacancy was just posted on Winejobs.com. It is a new position, as TWWIAGE has never had a dedicated viticulturist before. Instead, the owners of TWWIAGE went the traditional route of employing a vineyard manager who oversees all things grapey. But things change. I would not be an eligible candidate for the job. Neither would my young coworker, The Doodler, who is in the process of working his way through UC Davis and has designs on making a career out of viticulture. Why? Well, The Doodler, like me, doesn't speak Spanish and, furthermore, has no particular desire to learn Spanish. But speaking Spanish is a requirement of being considered qualified to perform the job of viticulturist. As The Doodler commented, in wry observation, "California [Napa] is the only place where one has to learn a foreign language in order to get a job in one's own country." Thought provoking.